After hours Friday, my contacts went kaput. I had no backups, no glasses, and had to serve on my church’s worship team in 2 days. I desperately needed to see a Dr so I could read my music and be able to see! I first spoke with Sara, who was super sweet and encouraged me to call in the morning in case there was a cancellation. 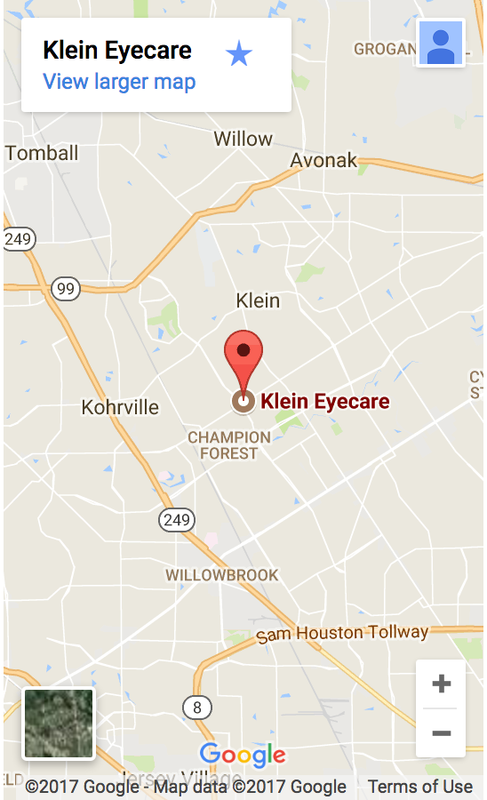 So I did, and despite being booked Klein Eye Care got me in that morning (today, Sat). The wait time was about 10 minutes, including paperwork. Lauren was the assistant, and she was really caring and nice, and made me feel welcome and comfortable. Their puff of air for the eye is worth the visit alone- barely feel It! I was impressed that she wiped all surfaces down in front of me so I felt at ease that everything was sterile. Then I met Dr. Abernathy. He is amazing. I’ve worn corrective eyewear for 36 years, and he is the nicest optometrist with the best bedside manner I’ve ever met! He really listened to me, and even found the cause of my eye irritation that led me there in the first place. He based his suggestion for contacts based on what made the most sense for me. Totally changed my quality of life – no more worrying about dealing with eye issues from those things! I plan to bring my whole family here, and am so grateful that from day 1, they made me feel important and were really there in my desperate time of need. I’m so so thankful for Dr. Abernathy and his team!! !